Aroma Essentials believes in Simple goodness for your skin. Aroma Essentials provide completely natural solutions for skin and hair without any side effects. Products are a combination of aromatherapy and botanical extracts. Aroma Essentials products are made of natural essential oils, natural vegetable oils, natural butter and emollients which are non-comedogenic and non-irritant and.hence safe for usage. This ensures that the products give your skin and hair nourishing, refreshing and revitalizing treatment. All Aroma Essentials products are handmade with natural ingredients. The shelf of almost all products is 6 months so you can really say that they are free of artificial preservatives. 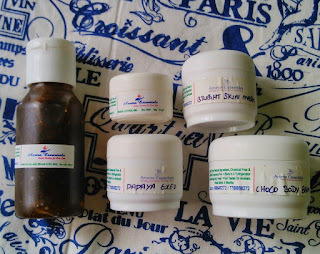 Madhurima of Aroma Essentials sent me some products according to my skin type. I have oily skin with faint post acne marks. At Aroma Essentials products are to be strictly used according to the skin type. The products which we get in market are made with chemicals, usually are for all skin types. But at Aroma Essentials each product is suited for a particular skin type thus ensuring effectiveness. I am very excited to use the products and share my experience with you all. I am currently using the sebum control gel and I will soon be reviewing the products. Have you tried any Aroma Essentials product/s? Share with me in comments section below.